The first week of June in Ontario is Local Food Week, and nicely paired with it, is Ontario Craft Cider Week. A number of participating restaurants and bars will be taking part in the week’s festivities, toasting all things craft cider. 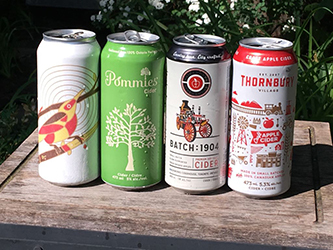 Like local food, Ontario craft cider is a gem worth celebrating. “Cider,” this Vineland report from 2016 explains, “is a growth opportunity that Ontario is well positioned to capture.” The same report states that cider was the fastest growing beverage sales category at the LCBO in 2015, and the LCBO’s 2016-17 Year In Review shows craft beer and cider once again as a vigorous force, with Ontario craft cider sales specifically jumping 39% to $7 million. The industry has indeed been rapidly growing, and making its mark in retail along the way. Last month it was announced that with the addition of 87 more stores, there are now over 350 grocery stores in the province authorized to sell beer and cider. With more location for sales, comes with it more opportunities for small beer and cider producers. And with the purchasing of local apples and pears directly from Ontario farmers, growth in the cider industry means profits not only for cideries and retail, but also for local growers. These auspicious relationships have also helped to strengthen and support agri-tourism in local municipalities, like the Town of Caledon for one. Following Ontario Craft Cider Week, Caledon will be continuing to celebrate Ontario-made beverages with their second annual Cheers Caledon! Craft Beer & Cider Festival on June 15th. To keep up to date with other upcoming events and news for all things Ontario Cider, be sure to check out the Ontario Craft Cider Association on their website and on Facebook.